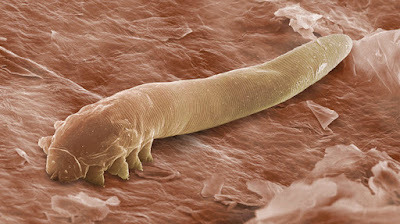 The harmless mite Demodex folliculorum, seen here in an electron microscope image, lives in the follicles of eyelashes. We're taking about Demodex folliculorum, the mite that calls your hair follicles home. "Probably if you've ever gotten a gross gunky plug out of a nose pore, that's what it looks like," says Michelle Trautwein, an evolutionary biologist at the California Academy of Sciences. "When you get to know them, they're actually pretty adorable." Trautwein and her colleagues have peeled the mites off microscope slides that they super-glued to their faces. They've scraped the little guys off people's foreheads with the curved end of a bobby pin. They've even ferreted out the insects' DNA from tiny spatulas of face grease." They've probably been with us since the origin of our species," she says. And Trautwein thinks the mites could help answer questions about human migrations through history, perhaps more than genetics or archaeology could alone because of how they're shared among humans. The mites are the latest in a not-so-regal lineage of parasites and vermin that could help pin down how human ancestors behaved and moved across the continents. When archaeological evidence is scant or human genetic data is too messy, sometimes these millennia-old frenemies — from rats to tapeworms — are the next best option. "You don't share them with strangers when you give them a hug hello," she says of the mites. They're mostly shared between sexual partners and members of the same nuclear family. Because of that tight bond, the mites can be a pretty good measure of where people came from. In an exploratory study published this month in Proceedings of the National Academy of Sciences, the researchers collected mites from the faces of about 70 people with different origins, most of them living in the U.S., and sequenced the mites' mitochondrial DNA. They found that people from different continents harbor different varieties of mites on their faces. Even generations after a family leaves one geographic region for another, Trautwein and her colleagues found, their descendants can retain those original mite populations. Think of them as family heirlooms. "Basically, as all humans evolved in Africa our mites evolved with us," says Trautwein. "And as populations became isolated they evolved into their own lineages, just like humans did." "They are potentially gross and they do infect us and take things from us, but to understand ourselves, it's a really great potential tool to use," says George Perry, an anthropologist and biologist at Pennsylvania State University who was not involved with the study. "It's an amazing, largely untapped area to learn about our own history." Perry's group is researching how tapeworms, which live in the intestines of mammals, could help show when hominins — human ancestors and their relatives — started consistently eating meat. The archaeological evidence is pretty meager — just a few scratched up animal bones from a couple of million years ago. It's assumed that human ancestors first got tapeworms when they domesticated pigs and cows sometime in the last 12,000 years and started routinely eating undercooked meat, which is how the worms would transfer over. But, he says, the three species of tapeworm that currently inhabit humans are actually most similar to those of lions and hyenas. Perry says the similarity suggests that hominins picked them up long before the domestication of herbivores, when they were consistently chowing down on the same animals as lions and hyenas. He's now studying tapeworm adaptations to heat stress to see if it yields hints about when humans started cooking meat. Rodents also have been useful tools in piecing together human travel routes. Rats helped corroborate the hypothesis that indigenous Taiwanese people first colonized Polynesia about 3,000 years ago. There isn't much evidence left of the first generations of people to colonize New Zealand, but there is archaeological evidence of a rat population that arrived on the island and was well established by about 700 years ago. That suggests that humans brought them there on their boats. DNA analysis showed that body lice diverged genetically from head lice somewhere between 30,000 and 114,000 years ago, giving archaeologists a minimum date for when people first started wearing clothes. Before clothes, there wouldn't have been an environment separate enough for a group of lice to inhabit and evolve separately from the ones on people's heads. "We're really just a habitat for all sorts of natural life," says Trautwein. "People think that evolution and wildlife are these remote things, but it's happening all over us."